Tom Fitzpatrick was born in a small fairly remote village in North Perthshire in the mid-1940s. Rather than watching television, like many other young people, there was nothing Tom liked more than spending his time either fishing or roaming the countryside. "I suppose my interest in wildlife and birds in particular, stems from that beginning," he says. 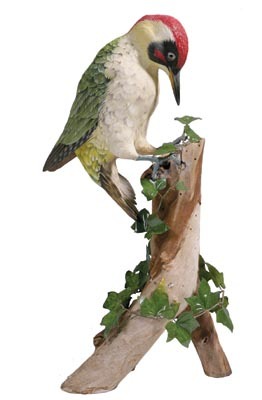 It is amazing to learn that Tom has no formal art training, but over the years he has taken an interest in carving birds and other wildlife, such as fish. Tom retired from the police force in 1996 and quickly joined the British Stickmakers' Guild (BSG) soon after. This introduced him to carved bird and animal heads, which he made for adorning the tops of walking sticks. "My introduction to full bird carving came when a friend who had asked for a stick with a woodcock head, decided that he wanted a full bird carving." Since this time, he has never looked back. By Tom's own admission, he was now hooked. 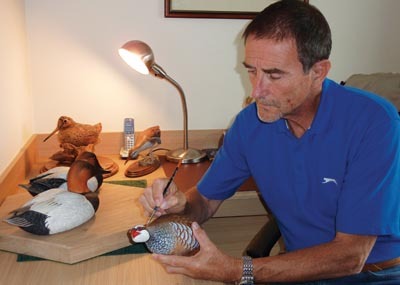 In 2001, Tom joined the British Decoy Wildlife Carving Association (BDWCA) and progressed through their competition levels. At the National BDWCA competition at Bakewell, in 2007, Tom won the British Championship and the BDWCA Championship with a covey of carved English Partridges. 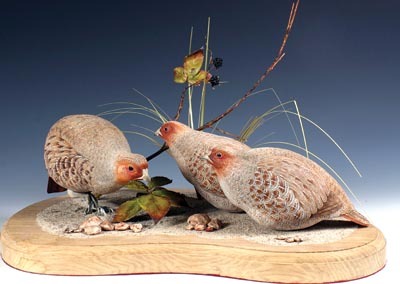 During 2008 he attended the World Bird Carving Championships in Ocean City, Maryland, USA. "I decided I could not travel so far without entering something. I entered a single partridge in the intermediate class and won first prize in the Game Birds category. The blue ribbon has pride of place in my workshop," he tells us. 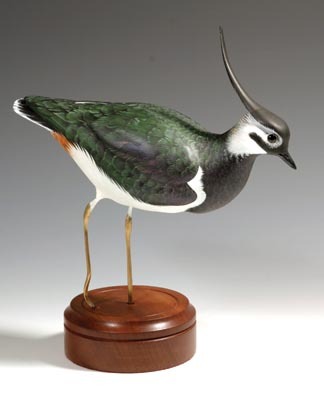 Tom supposes, like the majority of bird carvers, that his inspiration comes from a genuine love and interest in nature and the countryside. He frequently sits and watches birds, sometimes for hours at a time, most recently a covey of French red-legged partridges. "I can see one little hen rolling in the dust then lying on her side scratching her head. She is part of a group I am carving at present." 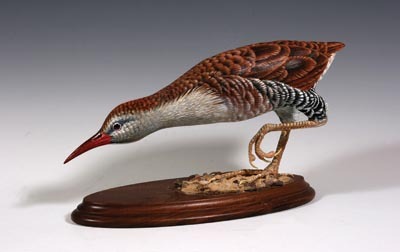 Tom also tries to keep up with what other carvers are doing, and finds that he is particularly inspired by some of the quality pieces produced by bird carvers in the United States. "If I had to say who I admire most, it would have to be the late John Scheeler, followed closely by Greg Woodard. Both have the talent for putting that extra spark of life into their carvings." In terms of carvers in the UK who inspire him, Tom cites Barry Woodcraft's wildlife pieces and his achievements to date. In terms of carving tools, Tom says how he doesn't profess to use a particular tool; he uses anything that removes the wood. He has been given the opportunity to enter the National Exhibition of Wildlife Art (NEWA) this year but due to unforeseen circumstances, Tom has not been able to complete a suitable carving in time. For similar reasons, sadly, he will not be showing at the BDWCA show in Bakewell this year either, but hopes he can next year. Over the years, Tom has carved dozens of pieces but, surprisingly, he says how he has never been 100 percent happy with any of them. "If I can look at a finished piece and say 'yes that is better than the previous one', then I am going in the right direction," he concludes. Tom's one regret in terms of bird carving it is that he did not discover it earlier. We will keep you abreast of the new carvings Tom produces and will let you know when he will next be exhibiting one of his beautiful pieces. In the meantime, enjoy some of his work on these pages.